Recently I have been publishing videos on platyceriums on YouTube. Click here to see the videos. I am publishing new ones every seek so take a moment to subscribe to my channel. Our condolences Paul Isley and the staff at Rainforest Flora. During the fires in San Diego county in December, All their greenhouses and plants were destroyed by the fire. In addition, several employees living on the property lost their homes and everything they owned. The Retain outlet in Hawthorne is still open and not involved in the fire. This web page is intended to help identify the different species of platyceriums. In addition to the different species, there are dozens of different hybrids and even more cultivar within the species. 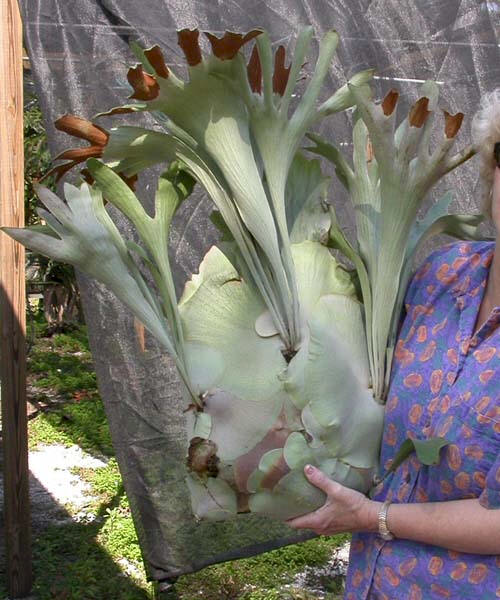 With this site I hope to encourage hobbyists to grow Platycerium Ferns and enjoy the rewards. I also list many of my pups for sale on Craig's List and eBay. If you find something you are interested in obtaining, contact me via email. Currently my collection includes 23 species/hybrids: P. andinum, P. alcicorne Africa, P. bifurcatum, P. Coronarium, P. coronarium Phillippinese, P. dawboy, P. elemaria, P. elephantotis, P. ellisii, P. grande, P. Horn's Delight, P. Horn's Dwarf, P. hillii (Jimmie, Hula Hands, Bloomei), P. holttumii, P. mt lewis, P. panama, P. ridleyi, P. stemaria White, P. superbum, P. veitchii, P. willinckii (Java, Pygmaean & Schofield). I also have a 35 year old under developed P. grande, but I suspect it may be a P. superbum. It has been growing in full shade and I recently relocated it to a sunny location and it is now starting to grow. Maybe in a year I will be able to see fertile fronds. 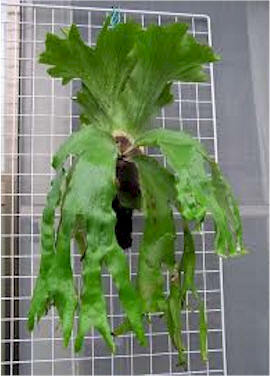 I also have a P. plastickii which is an artificial platycerium I picked up in Thailand. LAIFS jokingly named it a P. plastickii. NEW WATER TEST I have been running a test comparing the growth of Platyceriums using tap water, RO water and RO water with Super Thrive. The results are very obvious in just 14 days. Roy Vail has generated a list of Platyceriums based upon the Degree of Difficulty in growing which every hobbyist should review. A word about names. 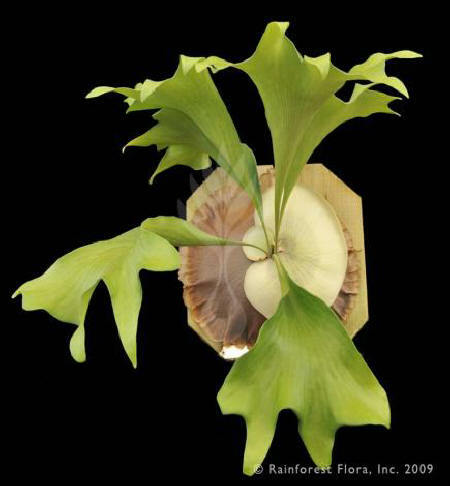 The idea of personally naming a new species or cultivar is a tempting achievement and because no formal national association has stepped forward to register platycerium names, the act of naming has become a 3 ring circus with multiple acts performing concurrently. Until DNA testing and a recognized organization takes the center ring, we need to recognize that many cultivars are duplicates with other cultivars, possibly growing in a different environment. An example is the P. bifurcatum Netherlands and P. bifurcatum Mickey's Delight which to me are the same with different cultivar names. Any hobbyist should take the time to research and know the difference between: a variety, a sport, and a cultivar. Platyceriums are displayed in many ways. In hanging baskets, on trees, and cedar and redwood boards. The redwood boards are the most durable and we have them available on this web page. One of the keys to identifying platycerium species is in the shape and location of the spore patches. 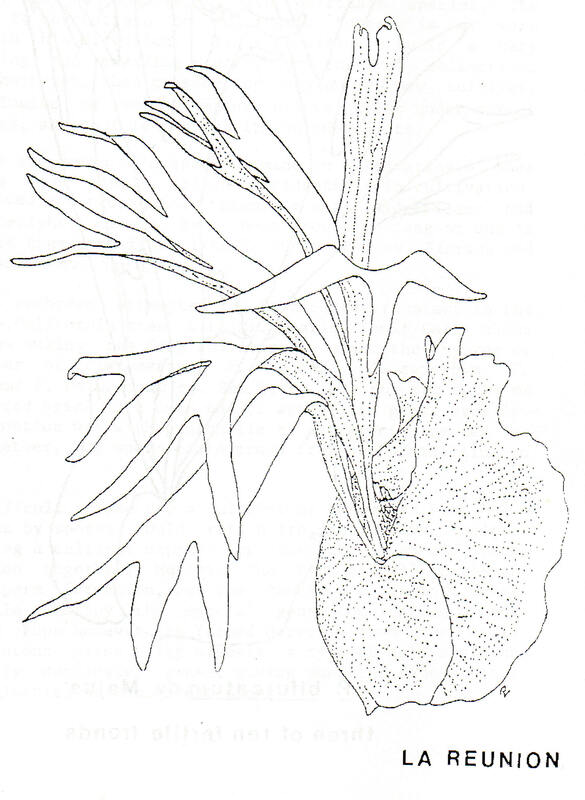 Some are located on the tips, some in the middle of the frond, and others on lobes. Some have two spore patches, others only one spore patch. 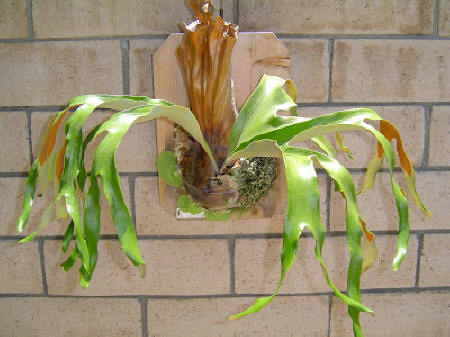 Most growers tend to over water staghorn ferns. See my thoughts on this watering problem and my water test. Growing light environment plays an important roll in plant characteristics. Temperatures should be kept between 35°F and 95°F but many species are less tolerant of cold. Good air circulation is important and can make the difference with difficult cultivars. Too much wind is bad. Shield fronds tend to grow in three different forms: basket, ball, and ring. P. alcicorne (al-ci-corn-e) also mislabeled as P. vassei. "Alcicorne" means elk or moose antler. P. alcicorne is very similar to P. bifurcatum. There are two forms of the P. alcicorne; one from Africa and one from Madagascar and they are uniquely different. Considered an easy-to-grow species with upright fertile fronds bending down on the tips. Pups well. Semi-hardy to 32°F (4.4°C). The East Africa variety are characteristically yellow-green, waxy with nearly no hair and the dead shield fronds turn rich brown when they die. The Madagascar variety fertile fronds are characteristically wide dark green, with many hairs. 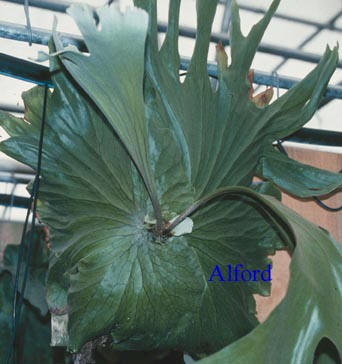 When grown in high light, the shield fronds grow folds in the upper half of the shield. Normal dieing of shield fronds begins at the bud and advances toward the edges. Narrow fertile fronds suggest a higher light environment is tolerated. The shiny, waxy coating on the fertile fronds prevents water loss under high light. P. andinum, (an-DE-num). 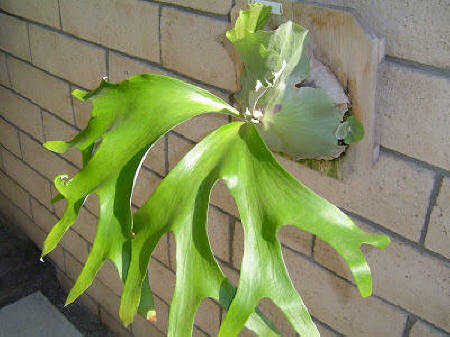 Common Name - American Staghorn. 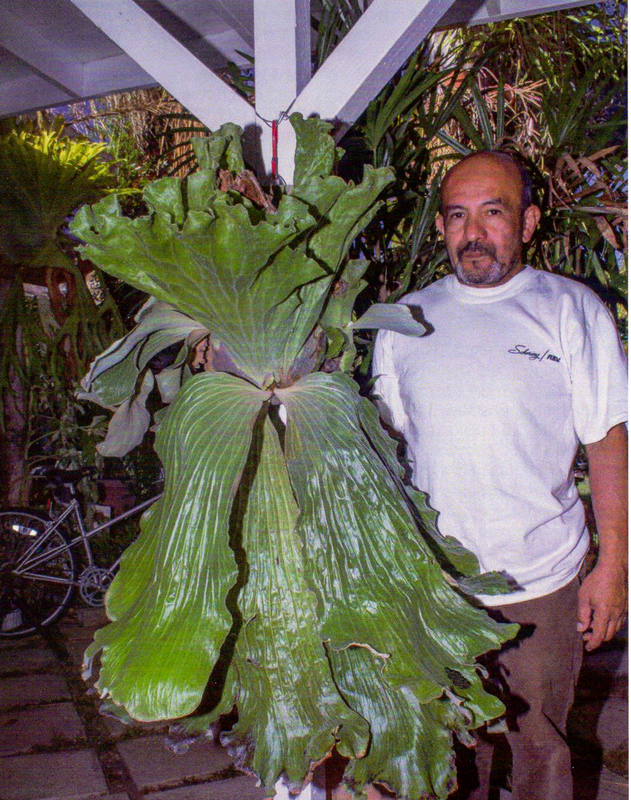 The only Platycerium native to South America, specifically in the mountains of Bolivia and Peru. Moderately difficult. This dry forest species needs good ventilation, and drying between watering. Temperatures between 70°F-90°F (21-32°C), low of 40°F (4°C). Requires low light. Produces pups readily. P. bifurcatum. 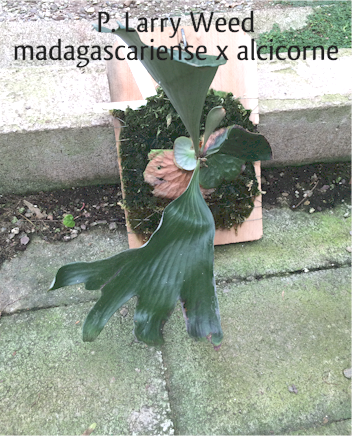 Common Name - Common Staghorn. Bifurcate means to divide or fork which describes the branching shape of the fertile fronds. Generally narrow fertile fronds, upright with the ends hanging down. Tips of shields are divided into lobes which are often pointed and extend forward. Shields are usually brown during spring and summer, green shields form during the spring and summer. Fertile fronds remain green, grow most of the year and last 2 or 3 years. Notice how the tip of the fertile frond ends turn down. This is a characteristic of the P. bifurcatum 'Netherlands'. Not all p. bifurcatums have this trait, it is unique to the P. bifurcatum 'Netherlands' cultivar. Most photos on the Internet of P. bifurcatum 'Netherlands' appear to be mislabeled because they do not turn down. Normally the P. bifurcatum fertile fronds point up. The pictured plant form Roy Vail is overgrown with shield fronds extended out excessively. It is a matter of time, and possibly a heavy rain, and these will eventually break off and fall to the ground. P. coronarium, (cor-o-NAR-i-um) which means crown, describing the shape of the mature mass of shields. Shield fronds are highly lobed and very thick and corky. Fertile fronds form a long and twisted mass, with spore patches on the underside of kidney-shaped lobes. There are reports of fertile fronds being extremely wide and other reports with extremely narrow fertile fronds as shown here. P. elephantotis. 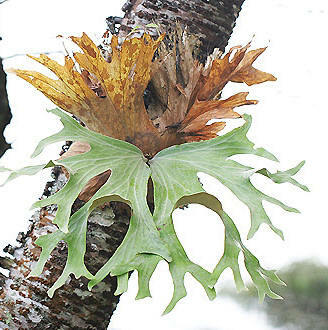 Common Name - Angola Staghorn. Moderately difficult. Thrives in warm temperatures of 80°F-90°F (26.6°C-32.2°C), low of 60°F (15.5°C). Produces large un-branched, dark green foliar fronds. The shield fronds are massive and die in the spring and need the tops trimmed so new shield can grow erectly. Large fern. Native to dry forests of tropical Africa. P. elemaria hybrid of P. andinum and P. elephantotis. Because of the name, it was popularly thought to be a cross with the P. elephantotis and P. stemaria, but recent DNA testing has confirmed P. andinum to be the parent. Observations suggest the second parent is P. elephantotis. Both the P andinum and P. elephantotis, have fertile fronds wide with wavy lobes and longer than the shield fronds are tall. Both have fertile fronds with deep prominent veins running length wise. Dan Yansura confirmed the parentage with P. andinum with DNA testing and Dr. Harald Schneider also found this parentage. Barbara Joe Hoshizaki also suggested the P. andinum cross with P. stemaria in a plant she sent Charles Alford. The shield fronds are smaller than the fertile fronds and wavy at the top. P. ellisii. (el-LEE-see-eye) Closely related to the African form of P. alcicorne. Both have the same yellow-green color, waxy coating, and they both grow round shield fronds in the sprng and early summer, and fertile fronds during the late summer and fall. The P. ellisii is unique in the fertile fronds are consistently wide and and divided into only two points near the tips. Originally from the mangroves forests of Madagascar, suggests they need a warm, humid environment, with filtered light. 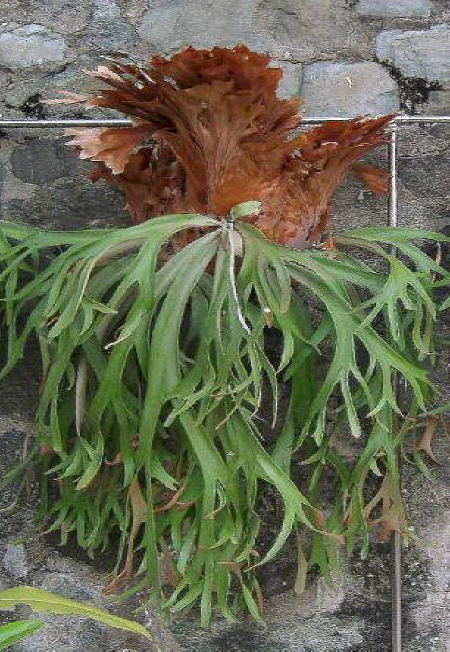 When the new shield fronds do not cover the older ones, it needs to be trimmed because the roots are shallow and the rhizome grows upward quickly. This is an annual requirement. Without trimming, new pups will not grow. P. grande. Difficult to grow. Likes high humidity but is easily over-watered. Young plants produce only basal fronds. Foliar fronds recline. Light green in color. Does not pup. Tender below 60°F (15.5°C). 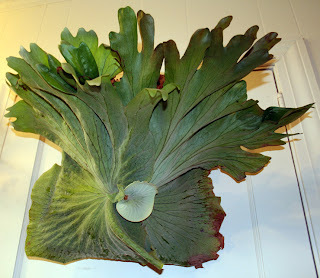 A large fern, prized by collectors. Native to Philippines. Notice how much sun this platy is receiving. Grande typically has 2 spore patches but no frills around the bud. When comparing photos of the grande and the P. superbum, the P. grande appear to have much thinner dangling fronds below the lobes with spore patches. P. hillii. Closely related to P. Bifurcatum, it is easy to grow with semi-erect dark green, foliar fronds. The fertile fronds are long, erect, wedge-shaped with forked tips. There apear to be a couple different forms for the P. hillii. There what I call the P. hillii (short fingers) and the P. hillii (long fingers). In addition their is the P. hillii Hula Hands which has even shorter fingers. One of the main characteristics of the P. hillii is the wide fertile fronds. 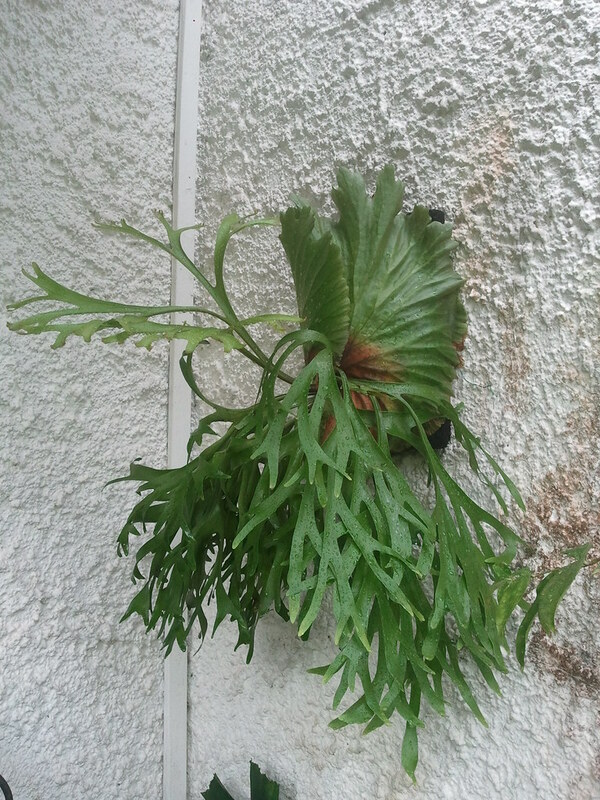 The shield fronds are rounded and less inclined to open into a catch basin like P. bifurcatum. The shield fronds turn brown naturally and have rounded to shallow lobes. Pups well. Semi-hardy to 40°F. Many species are available. The plant pictured is believed to be from the Steve Talnadge collection and has seen temperatures down to 33°F without any visible damage. However when temps rise above 100 degrees, un-filtered sun can burn the fertile fronds. Steve Talnadge named it P. hillii 'Jimmie'. Steve Talnadge of Chula Vista, CA operated Talnadge Fern Nursery for may years and his collection was sold off upon his retirement in the late 1970s. Grows shield fronds in fall and winter months. P. holttumii. (holttum-e-eye) Closely related to P. grande, P superbum, p. wallinchii and P. wandae. It differs from first two by having fertile fronds with two lobes, one smaller and elevated, the other larger and hanging down. Both lobes have spore patches. It differs from P. wandae by not having the little points (frills) on the edges of the shield fronds around the bud. 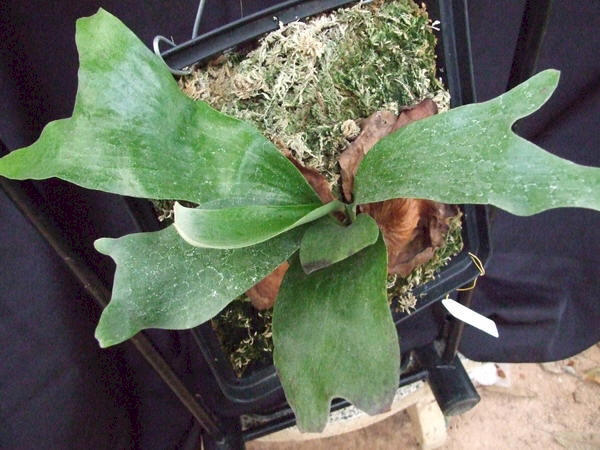 P. madagascariense (madagascar-e-en-se) A rare species with shields like no other platycerium. Their veins form tall ridges which surround little valleys, waffle like. New shields are thin and light green, but turn rich dark green when they mature. The shields cover the top of the moss and do not collect debris behind them. In nature, ants live in the shield fronds which may provide the fertilizer. Fertile fronds are wedged shaped with 1 to 3 shallow forks. Sore patches grow on the tips of the fertile fronds. 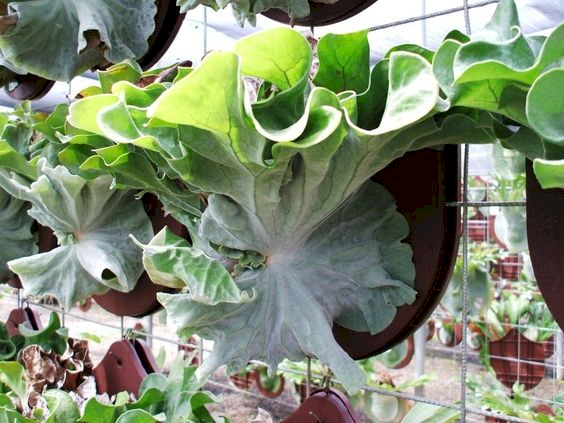 Considered a challenging plant to grow, it has been successfully grown in temperatures 32°F to 110°F but the extremes should be avoided and best grown in a greenhouse environment with lots of humidity. P. Mt kitshakood hybrid cross of P. ridleyi and P. coranarium. Displays traits of both parents. with large highly forked fertile fronds similar to P. ridleyi but grow in a twisted mass like P. coranarium, and the length of P. ridleyi. Only the P. ridleyii grows kidney shaped pods that produce spore. The shield fronds are lobed like P. coranarium and thick and corky, similar to P. Ridleyi. The thick corky shield fronds suggest climate above 40°F. Some reports suggest filtered light, but there are reports of healthy growth in bright light. The reader must realize that many hybrids are a result of accidental mixing of spore when similar plants are grown in close proximity. Even when spore from two species are intentionally crossed, it is always possible for a spore from an unintended species to contaminate the intended cross. After repeated attempts and proof that their progeny have the same traits, then we can agree as to the parentage and define it as a new hybrid and not just a sport or cultivar of a species. This can take a long time with slow growing platyceriums and experienced growers are hesitant to jump the gun and name a hybrid. So when we discuss hybrids, we need to consider all the variables. Soon we will have more definite DNA studies. Until DNA testing is more readily available, and established parent base lines defined, we must look at and compare traits from other species and deduct a logical inference to the actual parentage and these are considered individual plants and not necessarily a hybrid. P. ridleyi is one of my favorites. It needs to stay dryer and breezy than most staghorns. I suspect the breezy helps keep the fern dry. The spore grow on the underside of spoon-shaped lobes that protrude from the normal fertile fronds. The shield fronds grow so they keep most water water out of the root ball. It is common in the wild for ants to live deep inside and it is a symbiotic relationship that the ridleyi tends to attract, but probably not necessary for the growth of the fern. The ridleyi does not collect nutrients off water like other platyceriums. 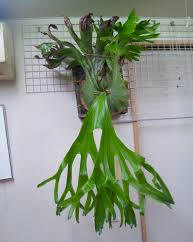 P. stemaria Common name: Triangle Staghorn. Large-growing wide shields, wavy at the top and short lived and are seasonal. The fertile fronds are often shiny on the upper surface, and quite hairy on the underneath. The fertile fronds show a main division into two lobes and each of these lobes divides once again. There are two spore patches on each frond, one on each main lobe, in the area of its division. When mature the spore patches are dark brown. More difficult to grow, requiring temperatures of 80°F (26.6°C) and not below 50°F (10°C). Needs high humidity and frequent watering. Semi-erect, large foliar fronds with a silvery cast when young. Produces pups readily in moist areas. Broad fertile and dark green suggest a filtered light is best and shelter from wind. This condition also suggests less spore production. It is expected, if grown in brighter light, the fertile fronds would tend to be narrower and shorter with more spore. NOTE: This so called species is under review and questioned. P. superbum. (su-PERB-um) Very similar in appearance to P. grande when young. Shield fronds are deeply lobed and may reach 4 ft tall. Upper edges extend forward to form a catch basin. Once the shield fronds reach 18 inches from the bud. fertile fronds can be expected. Each fertile frond has one spore patch, oval to nearly triangular and brown when mature. Large reclining foliar fronds light green in color. Does not pup. Hardy to 30°F (–1.1°C) for short periods, although prolonged cold temperatures not tolerated. 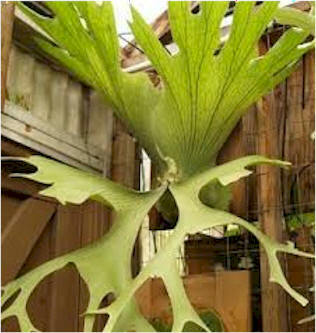 Likes brighter light than the average staghorn. Prized by collectors. Native to Australia. Similar to the P. grande which is native to the Philippines and has two spore patches and no frills around the bud. The P. superbum has only one spore patch and frills around the bud. P. superbum Cabbage Dwarf. 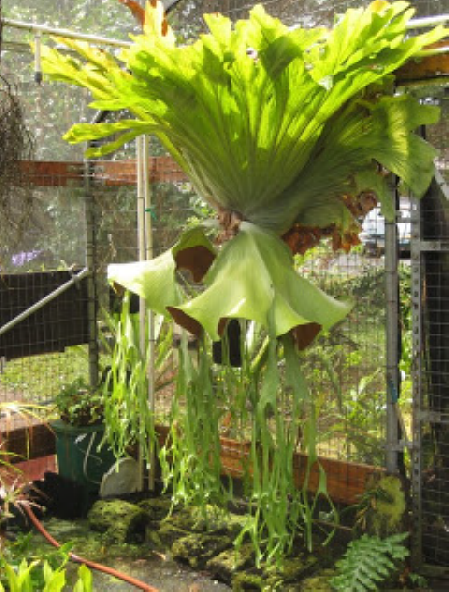 Little is known about this platycerium except they are found in Australia in a region heavily populated with P. superbums. Reports on Facebook point to a single spore patch on the fertile frond making it a cultivar of the P. superbum. P. veitchii. 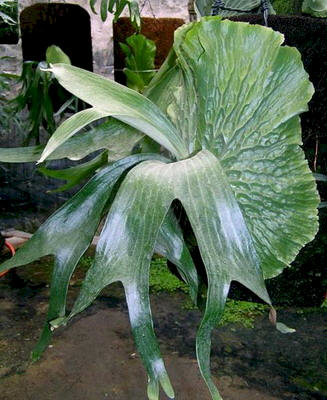 (veitch-e-eye) A common and easy-to-grow species with erect, silvery foliar fronds. Closely related to P. bifurcatum, but unique in several ways. Semi-hardy to temperatures of around 30°F (–1.1°C) and tolerant of light frost. High temperatures of 120°F. This is a semi-desert species native to Australia and requires a lot of light to show all its traits fully. The main identification feature is the tips of the shield fronds. P. veitchii features show a great amount of white hair on the fertile fronds. Its fertile fronds are very upright in high light. The tops of its shield fronds grow into tall thin fingers. As the shield frond decays, it leaves a distinctive skeleton of the frond. In high light, fertile fronds are shorter, lighter and more vertical with more spore patches. P. wallichii (wal-lee-key-eye) In nature tends to be 4.5 ft tall, but smaller in cultivation. The shield fronds form baskets and turn brown. The fertile fronds grow multiple rounded lobes and only the first two lobes have spore patches. The fertile fronds had distinctively prominent veins on the upper side. Eventually the fertile frond blends into the shield fronds. Plants tends to go into a dormancy stage and frequently die and never come out of dormancy. Some growers have successfully not watered it during dormancy, and others have kept it watered and prevented dormancy. More experience is needed. The spore are green and do not live long. This gives a short window for propagating spore, but they do volunteer fast in moist conditions. P. wandae. 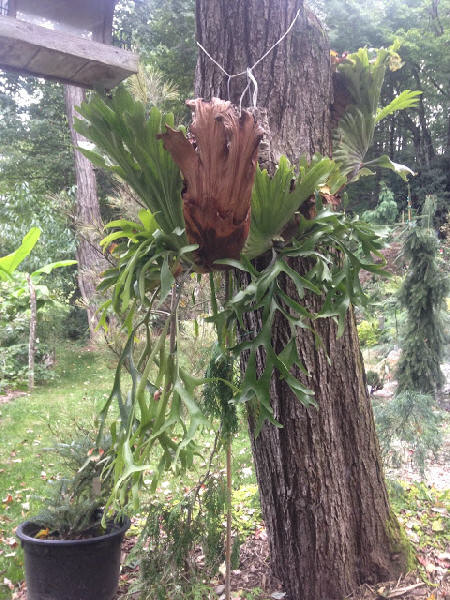 (wan-dee), The Queen Staghorn. 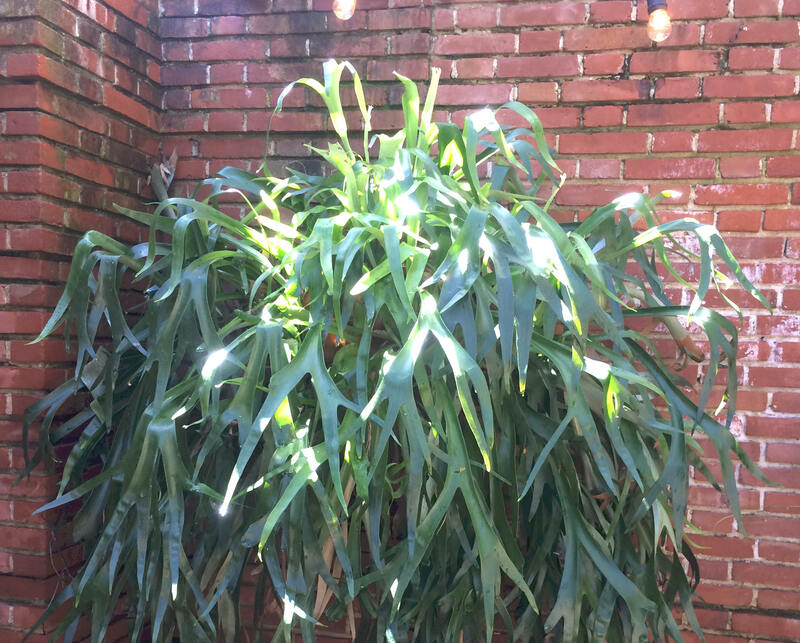 Needs high humidity; easily over-watered. Temperatures between 80-90°F (26.6°C-32.2°C), low of 60°F (15.5°C). 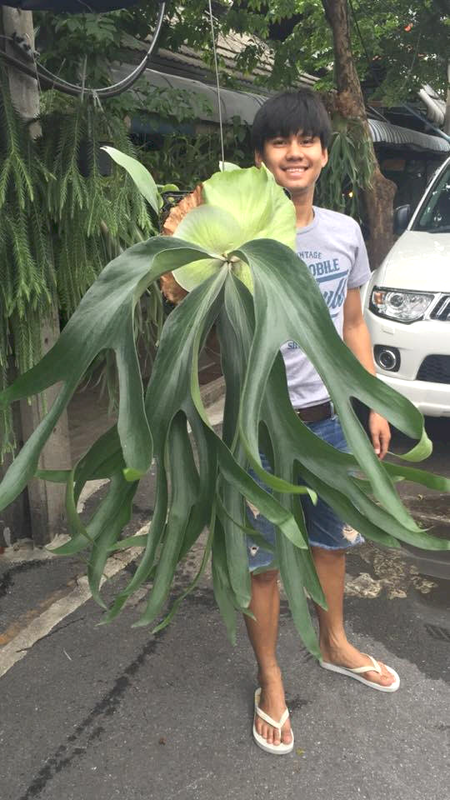 Possibly the largest Platycerium. Native to New Guinea. This culture needs plenty of space to grow in cultivation. Shield fronds are very upright and lobed along the top forming a basket. The fertile fronds grow two lobes with frills around the bud, the smaller lobe is elevated. Each lobe can have spore patches. Wandae typically has two spore patches, one smaller and elevated, and frills around the bud. 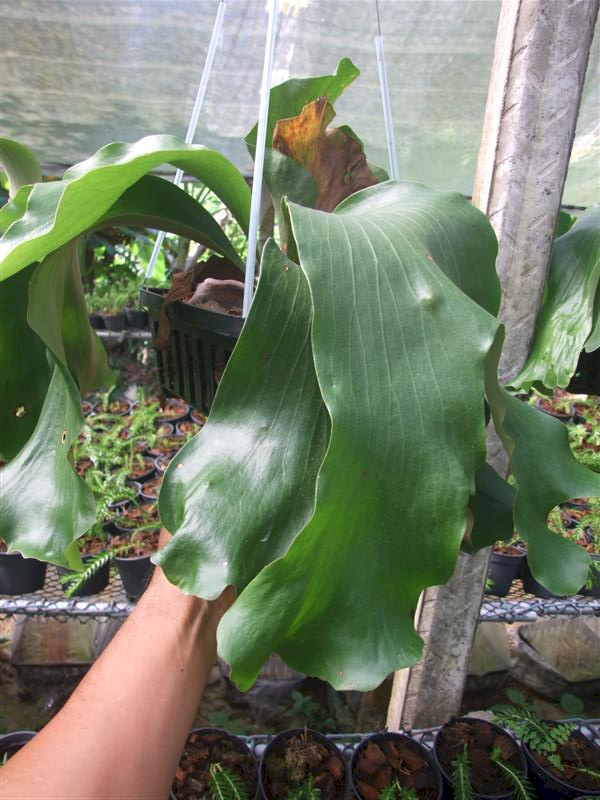 P. willinckii (wil-lin-key-eye) or Java Staghorn. closely related to P. bifurcatum but the shield fronds are different by being very tall and deeply lobed. They quickly turn brown and as they decay a mesh of veins is left standing. The the first thing I look for on P. willinckii is fertile fronds which grow edgewise at the bud and then hang down. Usually there is a stark contrast between the brown shield fronds and the green fertile fronds. A mature plant will have 12 fertile fronds growing out of the bud. 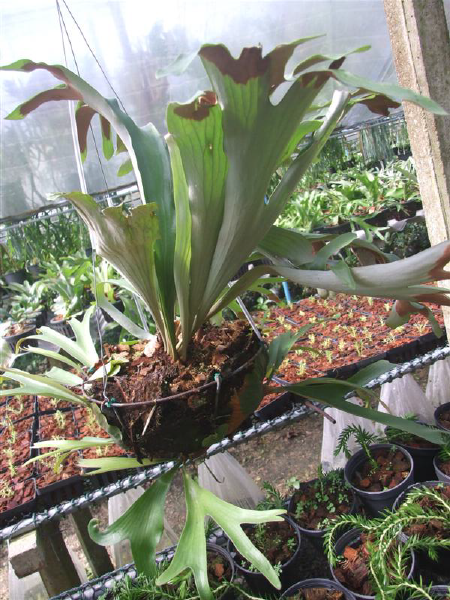 This platycerium is easy go grow but does not tolerate cold as well as P. bifurcatium. The bud is small and slow to grow fertile fronds suggesting it may be dead. But with time, the fertile fronds develop. Pups do form but not as freely as P. birfurcatum. Grows well in medium light, moist moss, and is not prone to rot. P. African Oddity hybrid (P. alcicorne and P. ?). 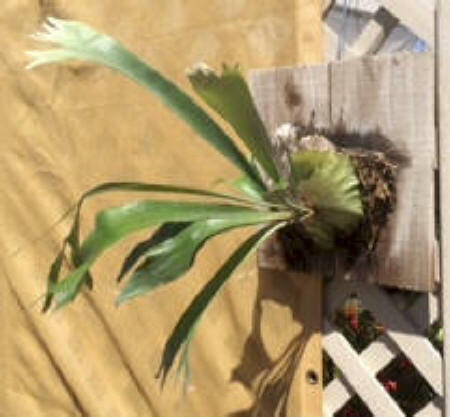 An accidental creation that appeared in Charles Alford's growing area in Florida. The P. African Oddity has been been duplicated through its progeny which have the same traits. Both in it's spore propagation and any pups. This ability makes it a hybrid. This photograph is from Tom's garden in Huntington Beach, CA. P. Callard hybrid (P. andinum and posibility P. quadridichotomum) This is a Charles Alford creation named after Don Callard, president of the San Diego Fern Society. Don has done more for platyceriums than most people realize. This author feels the quadridichotomum trait is obvious in the fertile fronds with the wide frond and the forking. P. quadridichotomums get their name from the forking which results in 4 tips. Both the quadridichomum and andinum have spore patches between the first and second fork and not on the tips of the fertile fronds. The andinum is also apparent in the fertile fronds plus the tall narrow shield frond whereas the quadridichotomum shield fronds flare out more to form a basket shape. The P. stemaria 'Laurentii' also grow a similar fertile frond and spore patches. P. charles alford is a hybrid believed to be a cross of P. wandae and P. ridleyi. Mr Charles Alford reports it appeared while sowing P. wandae spore in the mid 1980's. 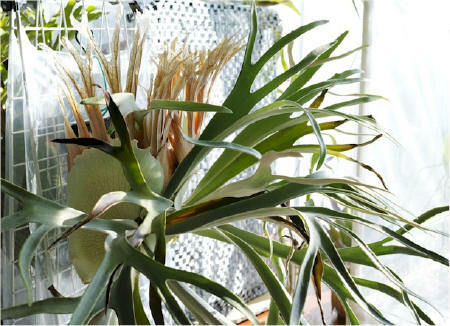 It was thought to be a sport of P. wandae, but current logic supports it is a true hybrid after growing for a few decades. This suggests spore from the P. Charles Alford will produce more plants displaying the same traits as the P. Charles Alford. P. dawboy. 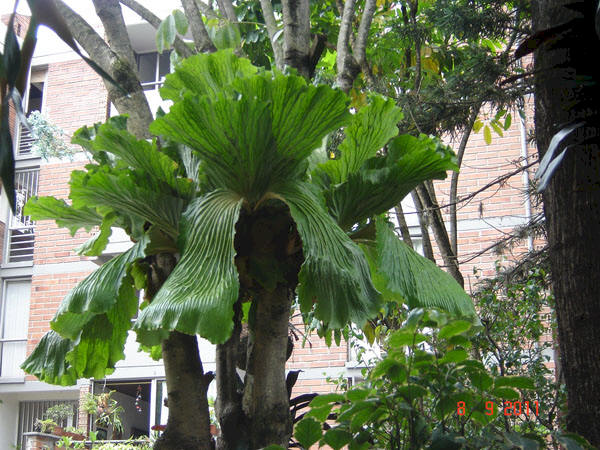 A hybrid between P. madagascariense and the Madagascar form of P. alcicorne where the shield frond is defiantly of P. madagascariense origin and dark green in color compared to the African form of P. alcicorne which is light green. Siam Exotica states the P. dawboy is a cross of P. madagascariense and the African form P. alcicorne 'Vassei' but my observations suggest it is crossed with the Madagascar P. alcicorne.. 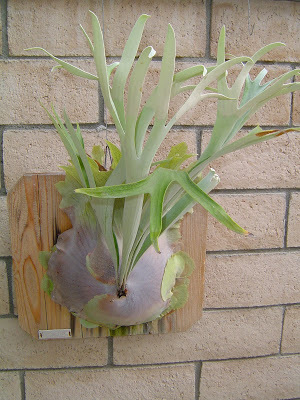 This author feels the African form of P. alcicorne and P. madagascariense should produce the P. Horn's Surprise hybrid. Most growers in the industry in the industry have agreed with Roy Vail who wrote the P. vassei was a P. alcicorne. Siam Exotica is suggesting the Vassei is a cultivar of the P. alcicorne. i.e, P. alcicorne 'Vassei'. This logic is further complicated by the appearance of the P. dawboy is dark green suggesting it is of the Madagascar form. P. diversifolium hybrid is a cross of P. bifurcatum and P. hillii. The fertile fronds are wide like P. hillii, and the shield fronds are round like P. hillii. Where the P. bifurcatum comes from is not obvious in this photo. 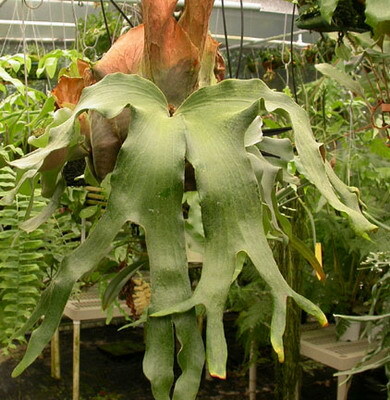 The P. diversifolium may be a larger than average platycerium. P. Horn's Surprise hybrid is a cross of P. alcicorne and P. madagascariense. 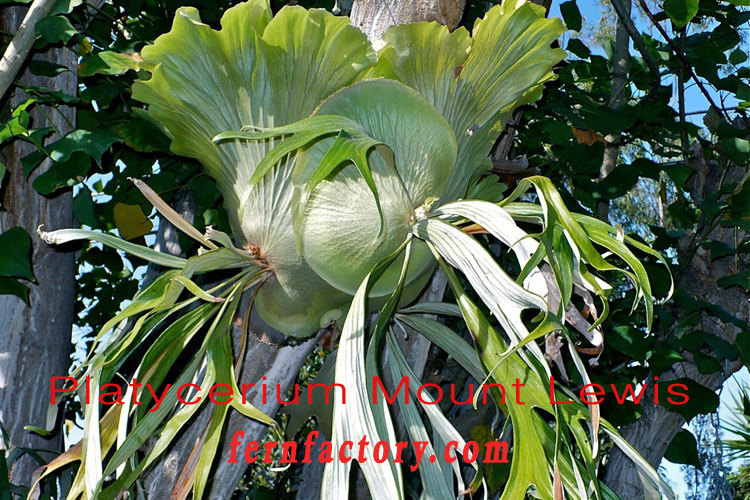 Named for Jerry Horn, a nursery man in Florida and was one of the first experts on platyceriums. Because of the light green color, it is thought to be an African form P. alcicorne. Charles Alford has a hybrid cross of P. madagascariense and P. alcicorne which he says is a reverse cross of the two. A nice photo is needed. P. Jimmy Davis hybrid from Charles Alford. This hybrid is a cross of P. ellisii and P. stemaria. The plant in the photo appears to have grown from spore, supporting the hybrid argument. P. Larry Weed (hybrid) is also a cross of the P. alcicorne and P. madagascariense created by Charles Alford. It appears to be the Madagascar form of the P. alcicorne. The shield fronds appear to be the typical P. madagascariense form with the deep folds. The fertile frond is wider, waxy like with pronounced veins. The color is also dark green, typical of the P. alcicorne from Madagascar. P. Lucy hybrid (P. alcicorne and P. ?) A product of two platyceriems growing in the same area, created by Charles Alford. Charles Alford's current thoughts are; "P. 'Lucy" is clearly derived from P. alcicorne, but it is gray, kind of fuzzy, and stays small. The shield do not clasp at the top. I can't imagine what parentage would make that plant or plant trait. Siam Exotica states the P. Lucy is a cross of P. ellisii x ?) If we combine the two arguments we get a cross of P. alcicorne x P. ellisii which is a possible cross. P. madagascariense x P. quadridichotomum from Charles Alford shows deep ridges in the shield fronds and medium green color. The fertile frond show the shape of the P. quadridichotomum and are darker in color. 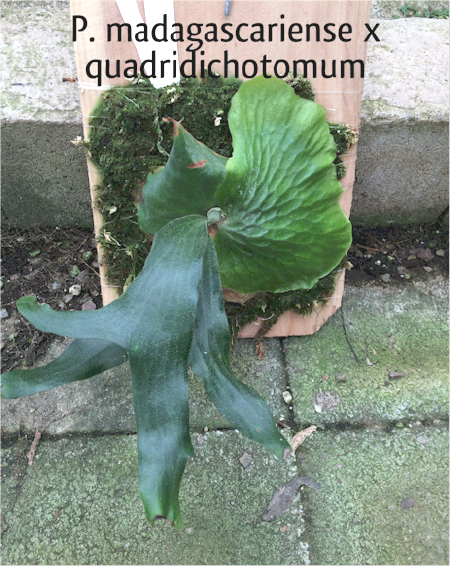 The P. quadridichotomum is a small dwarf like platycerium so it is not expected this hybrid will grow much larger. Siam Exotica lists a P. Durval Nunes which they say is a cross of P. madagascariense and an unknown. 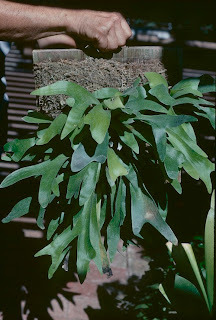 From the photo they give, this author believes it is a cross of P. madagascariense and P quadridichotomum which would be the same as Charles Alords hybrid. P. Roy Vail hybrid cross of P. madagascariense x P. andinum. From the gardens of Charles Alford. Obviously named after Roy Vail, author of the first bible on platyceriums, "Hobbyist's Handbook" Roy has put a lot of time and effort into promoting the P. andinum in Peru and Bolivia and supporting their efforts to conserve their natural growing areas from clear cut farming. Hopefully this plant will be in the trade some time soon. The shield fronds are waffled like the P. madagascariense, but tall and narrow like the P. andinum. The fertile fronds are wide and forked like the P. madagascariense yet longer like the P. andinum. This plant has not grown spore patches yet. 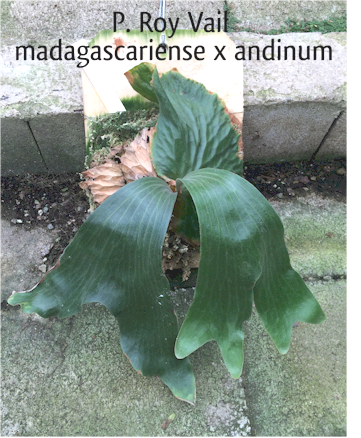 Overall, it is expected this plant will become larger than most P. madagascariense found in collections. 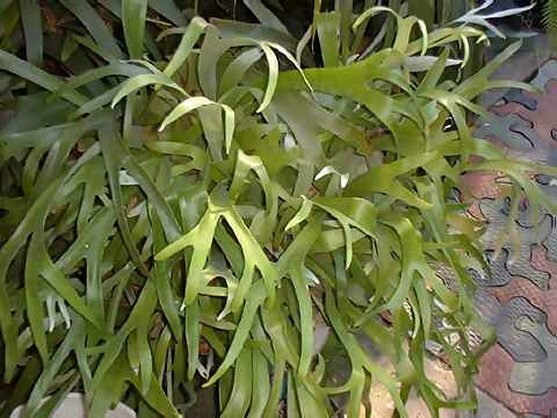 The color appears darker green than most P. madagascariense but that may be a result of the growing environment. P. silver velvet A hybrid grown from a cross between P. elephantotis & P. willinckii. 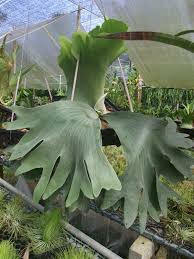 Grows massive shield fronds like the P. elephantotis and wide fertile fronds, only deeply branched like the P. willinckii. One could argue that there are traits of P. hillii with the wide fronds and shape of the shield fronds. Little is known about this cultivar, but we can assume it likes a warm climate between 60°F and 90°F and it grows pups. May like moist moss and not prone to rot. P. Yanid hybrid (P. willinckii and P. hillii). Both are of the Java-Australian group and today is called a hybrid whereas the pictured individual dates back before hybrids were popular and may have occurred naturally It is probably 50 to 75 years old. The fertile fronds grow edgewise which is a P. willinckii trait. The shield fronds are rounded, and not tall and not deeply lobed like P. willinckii, thus it is a P. hillii trait. 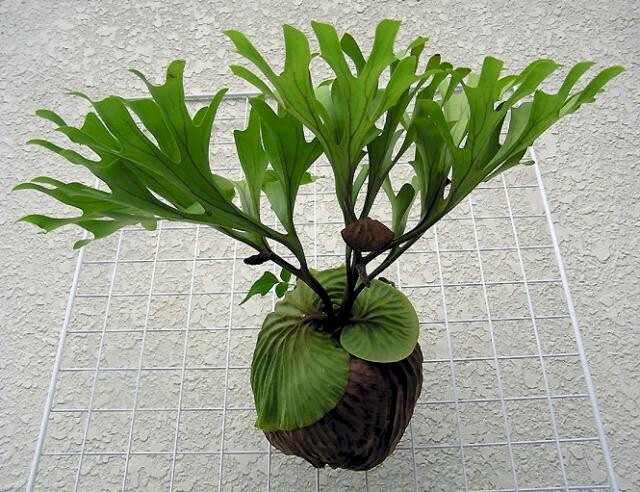 The shield fronds also grow in a ball form which is also a P. hillii trait. The plant shown is located at Filoli Gardens in Woodside CA where temperatures frequently drop below freezing for short periods during the winter. P. x mentelosii hybrid (men-tel-osee-eye) is a hybrid between P. superbum and P. stemaria. Also referred to as P. superbum x stemaria. This hybrid also called P. Fantastic Gardens by Barbra Joe Hoshizaki in her book Fern Growers Manual. Not a lot is known about this cross and today's growers may be calling it something different. The P. x mentelosii is considered a sterile hybrid, but Barbra Joe reports that some viable spores can be obtained from two lobes with spore patches. Like its P. superbum parent, the P. x mentelosii does not offer volunteers like the P. stemaria. P. bifurcatum cv Blue Boy, grown by Talnadge. He wanted to name the cultivar after the individual that provided the fern, but he had already named it Blue Boy. Similar to the P. bifurcatum above, but the tips do not turn down. Dark green and broad fertile fronds suggest it is growing in filtered light. P. hillii, 'bloomei'. Not much known but they do grow in So Cal area. May be the same as P. bloomei fingers, but the fingers have not grown on this plant. 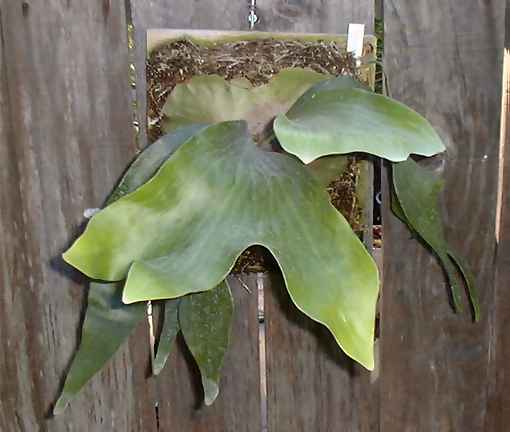 Wide waxy fronds suggest is retains moisture and should probably be grown in filtered light. P. hillii 'Hula Hands' Brought to Talnadge who wanted to name it after the person who brought it, but that person had already named it Hula Hands. There seem to be 2 or 3 forms in the trade. A unique platy from Polynesia that has fertile fronds with small fingers on the end. Easily identified and easy to grow. One hobbyist feels his hula hands died because he did not have enough humidity in his hot greenhouse. P. hillii 'Panama' is a cultivar of P. hillii species. The shield fronds hug the tree or mount closely making it difficult to water. The fertile fronds are wide like a typical P. hillii. 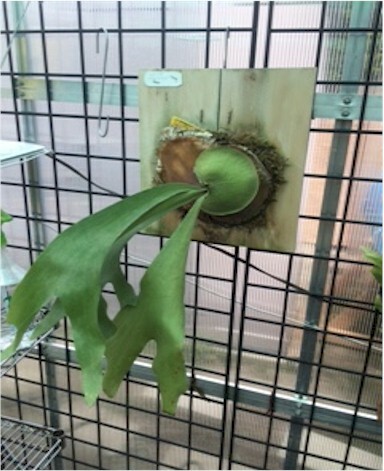 What makes the P. panama unique, it is a small platycerium and slow growing. It is hard to see the true characteristics of the P. panama until it is well established. P. panama is a small, slow growing platy with round shield fronds. Once established pups are volunteered slowly. P. Mt. Lewis is a cultivar more properly called P. willinckii cv Venosa. From Mt Lewis in remote northern Queensland, Australia and is probably responsible for the early reports of P. willinckii in Australia. 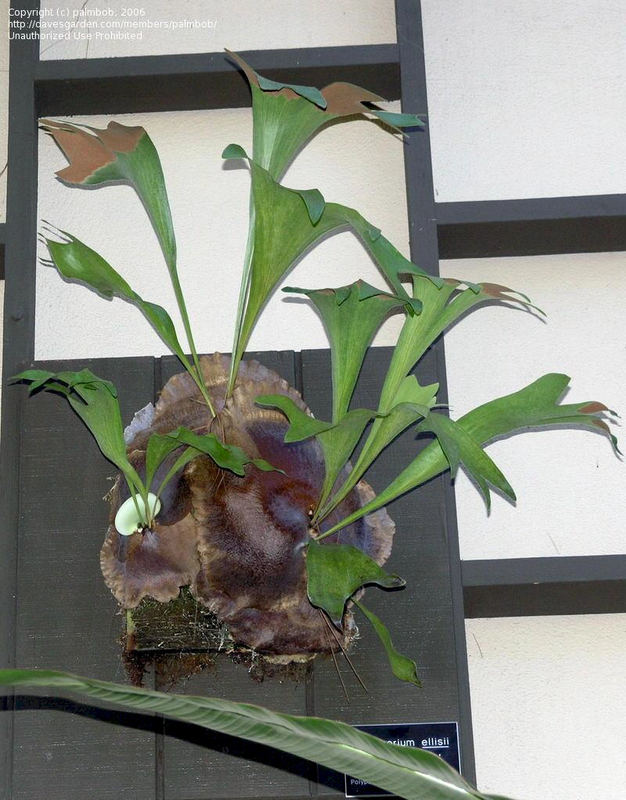 There appear to be two forms, one with narrow strap like fronds, and one with wide fronds. They both hang down and produce spore on the underside. The shield fronds tend to be roundish on the bottom, and majestically tall and deeply lobed on the top. P. Durval Nunes hybrid which Siam Exotica states is a cross of P. madagascariense and ?. P. la reunion is no longer found in the trade. It is believed that mariners collected them years ago, probably from Reunion Island, and spread them around calling them La Reunion. When in reality, they were probably P. bifurcatum or another common platycerium. 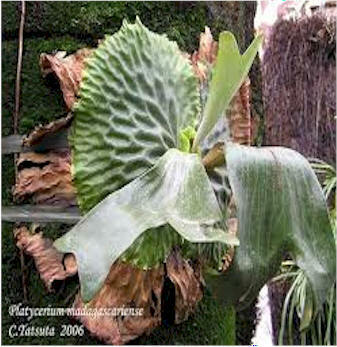 Many of the photos on this web site have been taken from other platycerium web sites. 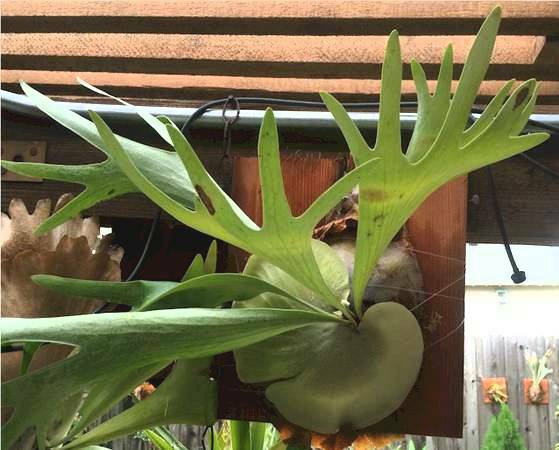 Namely Tom's Staghorn Ferns, Don Eckel, Platycerium Ferns, Facebook and others.